The Florida Supreme Court has made an unprecedented decision from the bench today – they decided to join Twitter! The Florida Supreme Court made a decision today that might go down in history as the most unique of its kind. 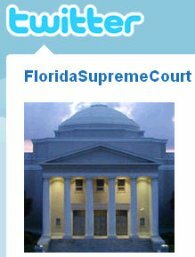 Florida’s high court decided to join Twitter and create it’s very own Twitter profile! Florida’s Supreme Court has always made efforts to be at the forefront of technology and integration. They were among the first in the nation to use the Internet, posting some documents online in 1994. By 1996, it was releasing its weekly rulings on its Web site, while maintaining its dockets and providing access to filings, according to News-Press.com.